Visme is an all-in-one visual content platform that allows everyone, including non-designers, to create beautiful presentations, infographics, reports and social media images in minutes. 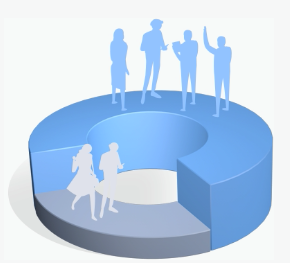 Easy to use for the novice, yet powerful and scalable for the more advanced content creator, the tool has a lot of features that not all users may be aware of. 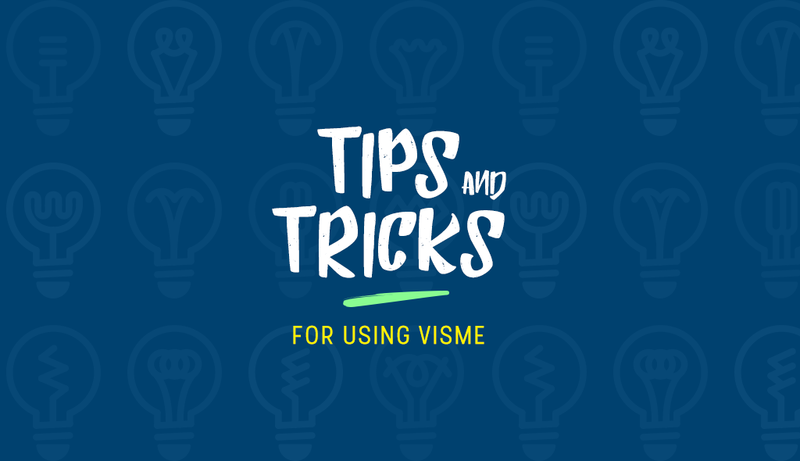 That's why we decided to create this list of quick tips and tricks for using Visme that will make your life a whole lot easier. 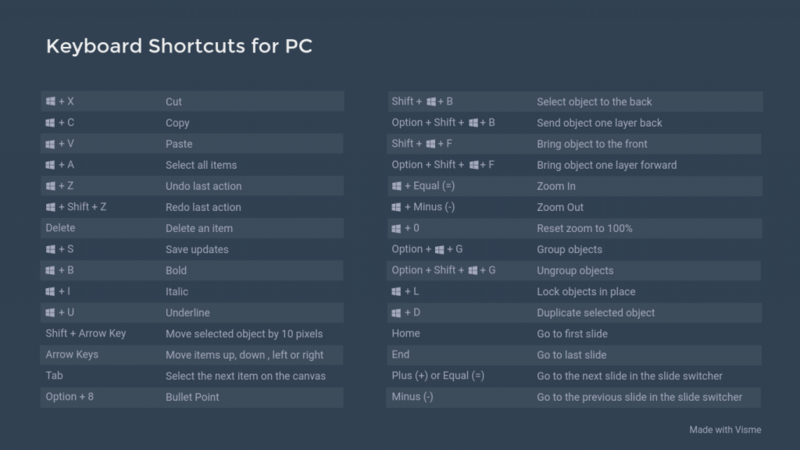 Also, make sure to take a look at our keyboard shortcuts at the end of this post. Press Shift + Click to select several objects. You can then move them together or group them. Click + Drag to draw around objects you want to select (which grabs everything in that area). Press Control+A to select all objects on canvas at once and move them around. To avoid objects from moving around by accident, select them and right click+Lock. To size objects proportionally, click on Lock icon. Or press Shift while dragging the object's corner handle. Select multiple objects and then click Align to automatically align them to top, bottom, middle, etc. Move an object in front of another by selecting it and right click+Bring to Front. Distribute objects evenly by selecting them, click Align to and selecting Horizontal. Press Alt+8 to create an instant bullet point. Convert a text block into a button by selecting block, then click Settings, click Border On, and choose Fill Color. View all objects on your canvas by clicking Objects at the top left. Hide/show objects by clicking on eye icon. Change their order by clicking and dragging them. To identify each object with a name, click Objects and click on the text to type in new name. Create banners with "smart shapes" that allow you to change the width without changing the length. Use "smart lines" that allow you to stretch them to the desired length, without distorting them. Select an object and right click+Duplicate to copy it. For more quick tutorials, visit our YouTube channel or take a look through our Product Features section and Support section to get an overview of each new feature. Any other common actions we missed that you'd like to include in this list? Let me know below! please include curved line, and curved arrow to your collections. It will make a diagram creation easier. Hi Beena. No worries. You’re going to be able to create diagrams easily with Visme in near future; it’s in the works. amazing guide to using Visme thanks for sharing tips it’s really very helpful for me. It was me who kindly asked on Visme chat and in the mail for some keyboard shortcuts/tips & tricks. This content should be in seperate e-book for every new Visme.co registered user. is there some way to make pictures disappear or exit the stage by clicking on them while in preview mode? Is it possible to set up a heading that would stay in place as the infographic scrolls down? Like locking header rows in Excel. Is there an option in order to add page number on a report?